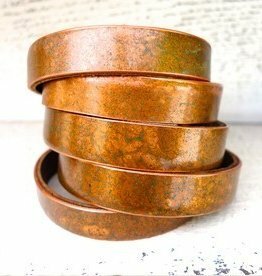 1/4" wide stackable bracelet patinaed or hand-painted for vibrant color. 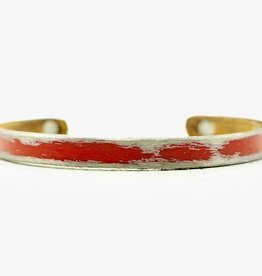 Each bracelet is adjustable to most wrists and lined with leather for comfort and hypoallergenic purposes. Stack multiple colors for endless combinations. 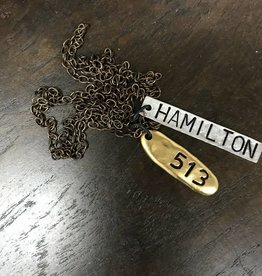 Unique steel and brass necklace showing Hamilton and area code pride. Great for yourself or a gift for someone that has moved from the area. Hamilton 513 Necklace *Exclusively Ours! Mini versions of our bracelets to wear on your fingers... some people call them rings. 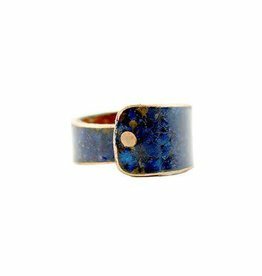 Each ring is adjustable to fit most fingers and are lined with leather for comfort and hypoallergenic purposes. Rings are 1/2" at its widest and 1/4" at its thinnest. These 1.5 inch long earrings are made from copper, steel or brass and hung from sterling silver ear wire. 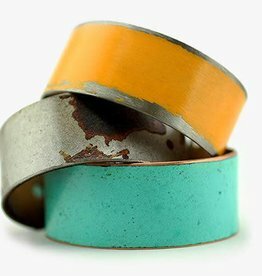 Each piece is colored by and all natural patina or hand-painted to give it a unique and vibrant color.